Every year, employees and fans of Seminole County Public Schools are asked to contribute to the “Give One for the Kids” Employee Giving Campaign. 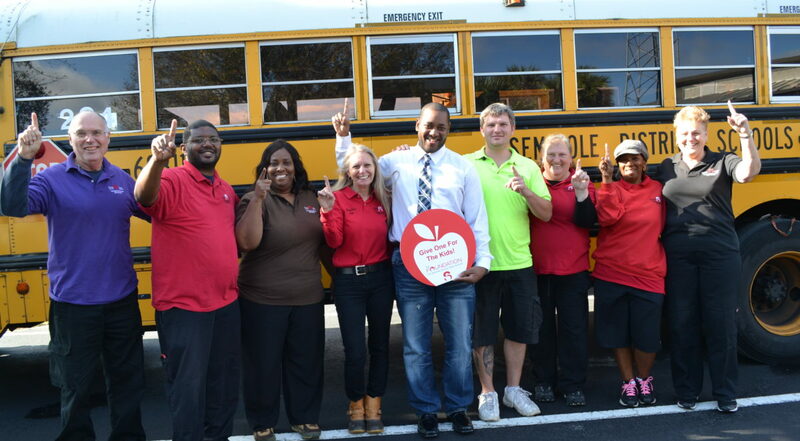 The campaign provides the opportunity to support two organizations – The Foundation for Seminole County Public Schools and Heart of Florida United Way agencies. SCPS teachers and district staff donate nearly $100,000 annually to support The Foundation’s programs. Those funds provide classroom grants, backpacks and school supplies to students in need, recognition awards for teachers and District employees, and more. Business partners and community members also donate generously. Donations to The Foundation are accepted throughout the year. Use the “Donate” button to give online or contact The Foundation for Seminole County Public Schools to fill out a pledge form. For more information, contact Donor Relations at 407-320-0119.